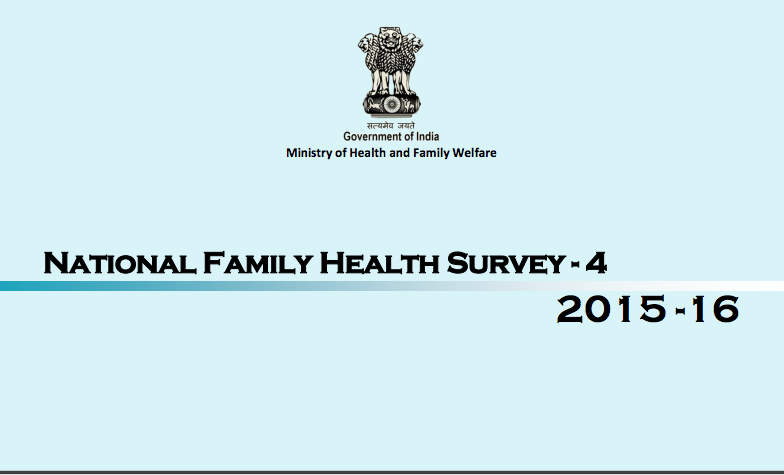 The National Family Health Survey 2015-16 (NFHS-4), the fourth in the NFHS series, provides information on population, health and nutrition for India and each State / Union territory. NFHS-4, for the first time, provides district-level estimates for many important indicators. The NFHS-3 was conducted in 2005-06. 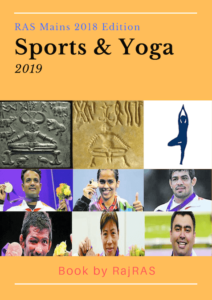 After a gap of 10 years, NFHS-4 (2015-16) has been released recently by the ministry of health. NFHS-4 fieldwork for Rajasthan was conducted from 23 January 2016 to 21 July 2016 by Institute of Health Management Research (IIHMR University) and gathered information from 34,915 households, 41,965 women, and 5,892 men. Infant mortality rate (IMR) in Rajasthan has taken a dip from 65 per 1,000 live births to 41 per 1,000 live births in the past 10 years. However, according to NFHS -4, there is a vast difference between IMR in rural areas and in the urban areas. In rural areas, IMR is 44 deaths per 1,000 live births. In urban areas of the state, it is 31 deaths per 1,000 live births. Under-5 mortality rate (U5MR) has also witnessed a dip of 34 points in the state in the past 10 years from 85 per 1,000 live births to 51 per 1,000 live births. More percentage of women in urban areas is receiving maternal and child care in comparison to their rural counterparts. The difference between urban and rural women in getting maternal treatment indicates that rural women are yet to get the same kind of health facilities which the urban women are getting. Percentage of children in urban areas receiving vaccination against diseases is higher in comparisons to kids in rural areas. NFHS-4 shows that 53.1% of children (12-23 months) in rural areas are fully immunised wheras 60.9% of such children in urban areas have received vaccination. Percentage of child marriages has gone down significantly over the last 10 years. In 2005 06, 65.2% of women in the 2024 year age-group had got married before 18 years. The percentage of such women has reduced to 35.4% in 201516, reporting a decline of 29.8%. There has been a decline in spousal violence cases and a rise in women having bank accounts. The percentage of women experiencing spousal violence has also seen a huge drop. NFHS-4 survey says this category has dipped from 46.3% to 25.1%. Over the past 10 years, the percentage of women participating in household decisions has risen from 65.1% in 2005-06 to 81.7% in 2015-16. There is also a decline in the percentage of women with anaemia. 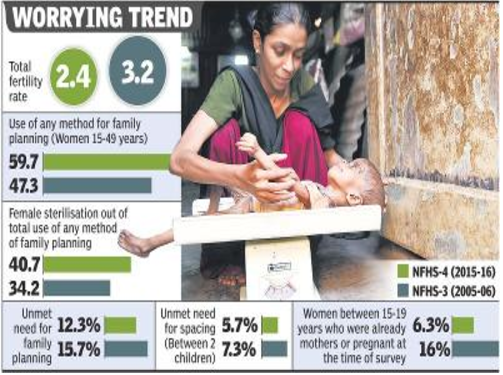 Ten years ago, 52.6% of non-pregnant women and 61.7% of pregnant women were anaemic.But, now it has reduced to 46.8% among non-pregnant and 46.6% among pregnant women. As far as access to healthcare facilities is concerned, more women are now have such facilities in hospitals.In 2005-06, 29.6% of the total childbirths happened in hospitals. This has increased to 84% in 2015-16. Additionally, now, 86.6% of the births are assisted by a doctor nurse or any other health personnel in comparison to only 41% 10 years ago. Women are taking literacy seriously. 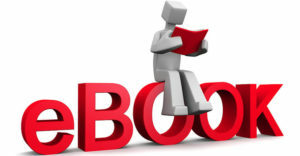 The NFHS data shows that the literacy rate has increased from 36.2% to 56.5%, a jump of 20.3% over past 10 years. 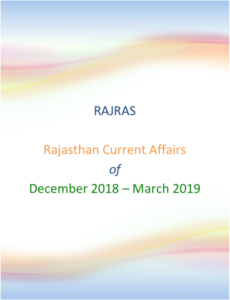 The state has witnessed a sharp decline in the total fertility rate (TFR) over the past 10 years, Rajasthan’s TFR has reduced to 2.4, which is still slightly higher than 2.1 — the goal for achieving a stable population growth. The TFR is calculated as an average number of children expected to be born per woman during her entire span of reproductive period. The percentage of children who are severely wasted (low weight for height) has increased in the state in a decade from 7.3% to 8.6%. Besides, only 3.4% of the total children in the 6-23-month category receive adequate diet in the state.